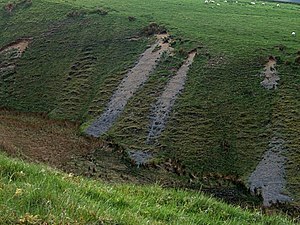 The cycle of erosion was a model for stream erosion and landscape development proposed by William Morris Davis in the late 19th century. Davis’ Stages in the fluvial cycle of erosion published in 1909 defined a young, mature, and old sequence in the development of river valleys and the landscape the rivers were eroding. His basic concept includes a rapid tectonic uplift, followed by cessation of the land, which allows the rivers and streams to reduce the surface to a level close to sea-level. The concept of peneplanation was a part of his model. In his model Davies picked up ideas of John Wesley Powell about limitation of erosion on land and concluded that sea level is the ultimate base level for sub-aerial erosion. 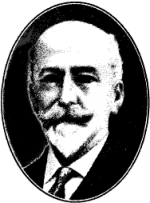 Further he suggested that streams always have at least some gradient and temporary base levels, such as inland-lakes, are controlling points upstream of them. The model developed by Davis, though important in historical context, is currently considered only a first approximation. Developments in the sciences of geology and geomorphology, especially the plate tectonics revolution of the 1960s and 70s, have confirmed the preliminary nature of the model. The cycle of erosion, as envisioned by Davis, has its initial stage at a time when the landmass is rapidly elevated by internal earth forces, followed by a very long period of tectonic quiescence. Once raised high above sea level as a landmass, streams come into existence and erosion begins to operate on the uplifted mass which is gradually worn down almost to a plain. The landmass may, at some later time, be rejuvenated and the cycle begins again and remnants of the earlier cycle of erosion are preserved at new and higher levels. In a normal cycle three stages have been recognized as: youth stage, mature stage and old stage. These follow each other in a regular sequence. In this stage the river flows along an uneven surface and there is intensive bottom erosion, the gradients are steep and the erosion is rapid. The rapid deepening of the channel leads to the formation of V-shaped valleys. Thus during the youth stage of a river, the valley form undergoes vigorous development, particularly in depth and head ward growth. Lakes, rapids, waterfalls, steep-sided valleys and gorges are of common occurrence during this stage. Besides, the phenomenon of river-capture or river piracy takes place in this stage. Youthful rivers have an irregular long profile (thalweg) from source to mouth. When one of the two rivers flowing in opposite directions from a single divide, becomes more effective in erosion due to steeper gradient (when the slopes are unequally inclined), the divide gradually recedes towards the side with the gentler slope. 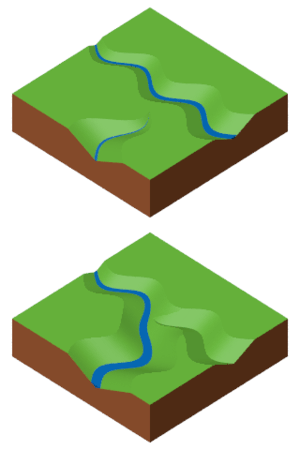 In other words, the river with steeper gradient extends its valley head ward thus causing a shift of the divide against the river with gentle gradient. Gradually deepening of the valley continues head ward with pronounced dissection of the ridge (divide). Sometimes this head ward migration of one river enables it to reach the river on the other side. But, as the first river has a steeper gradient than the other one, the course of the second river gets diverted and its water starts draining through the channel of the first river. This process of diversion of a river by the head ward migration of another river is known as River-Capture or River-piracy. The point where the course of the second river is diverted is known as the Elbow of capture. The captured river is known as Misfit and the deserted part of its channel through which no water flows is termed as the Wind-gap. In this stage rivers attains a profile of equilibrium. The land mass is fully dissected and a well-integrated drainage system is developed. Ridges and valleys develop prominently. Flood plains develop and river meandering takes place. The topography consists of features such as: hogbacks, cuestas, mesa, butte, meanders, oxbow lakes, natural bridge, flood plains, alluvial fans etc. In this stage the slope is gentle and the velocity is low. The river lose most of its erosive power and flow in a sluggish manner. In old age a river has maximum meandering. The river at this age does little of erosion and transportation but is mostly engaged in deposition. This stage is characterised by the development of distribu­taries and the river flows almost at the base level of erosion. The topography consists of features like peneplains, natural levees, deltas etc. Most of the cycles of erosion do not reach the final stage, as sometime during their operation either climatic or tectonic disturbances take place, and thus results in an incomplete or partial cycle. the article is good but how does this davisian cycle of erosion differ from that of L.C kings model of slope retreat. I query so much the Davisian cycle of erosion from the view point of assumption that flat slopes are old and steep slopes are young. We must appreciate the creation of God since the planet earth was created on the first day of His creation hence criticising the fact that flat slopes are old and steep slopes are young. wonderful notes, exactly as thought in class. keep it up. Excellent way of explaining… Thnx..